Here in the United Kingdom there was a cultural phenomenon called Subbuteo that defined the life of many an enthusiastic young boy during the eighties. My life back then was a constant background murmur of gaming properties that would now be considered within the domain of the ‘hobbyist’. We had a Games Workshop a mere bus-ride away into the city centre. Fighting Fantasy gamebooks were a ubiquitous presence on the bookshelves of many young lads (and almost always lads). A non-trivial chunk of us had original copies of Heroquest (myself included) never realising the almost mythic, totemic power that game would have in the latter days of this decade. Seriously, it wasn’t actually very good. You’ll be disappointed if they ever reprint it. Mark my words. The best thing about Heroquest is that none of us actually have to play it. It’s hard to know really how transferable my life experience is, so I’m going to break this review of Ice Cool up into two different parts – one for a middle aged UK audience, and one for everyone else. If you grew up in the UK during the eighties, turn to review 1. Otherwise, turn to review 2. It’s like Subbuteo, but with penguins. Or rather, it would be like Subbuteo if Subbuteo was actually fun. Innit. Also, do you guys remember Thatcher? She was a piece of work, right? Still, Theresa May – makes Thatcher look like a moderate. And remember Spitting Image? I saw a few episodes of it quite recently. It didn’t age well. Like us. Look at us. Look what has become of us. When did this happen? HOW DID WE GET SO OLD? This is the end of the review. Spend your remaining few hours before the embrace of the grave reflecting on the cold, desolate country we have forged with our collective political indifference. O Discordia. 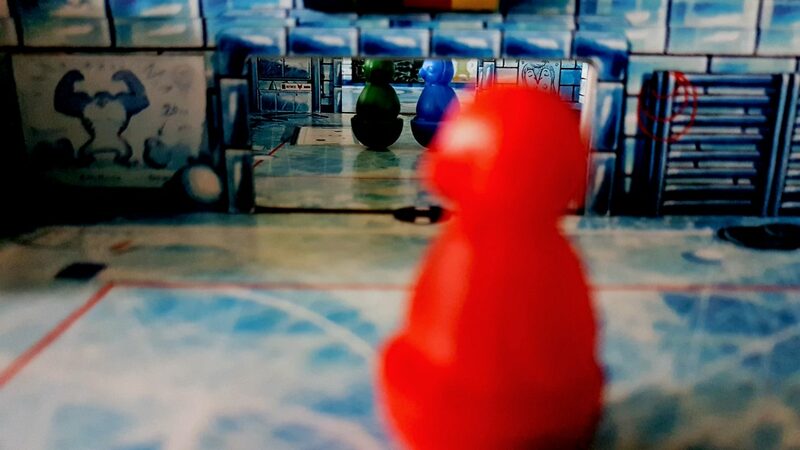 Ice Cool is an almost pathologically simple game – if there’s were any opportunities for layering in unnecessary complexity they have all been competently avoided. I don’t think realistically you could strip it back any farther without losing something substantive in the experience. 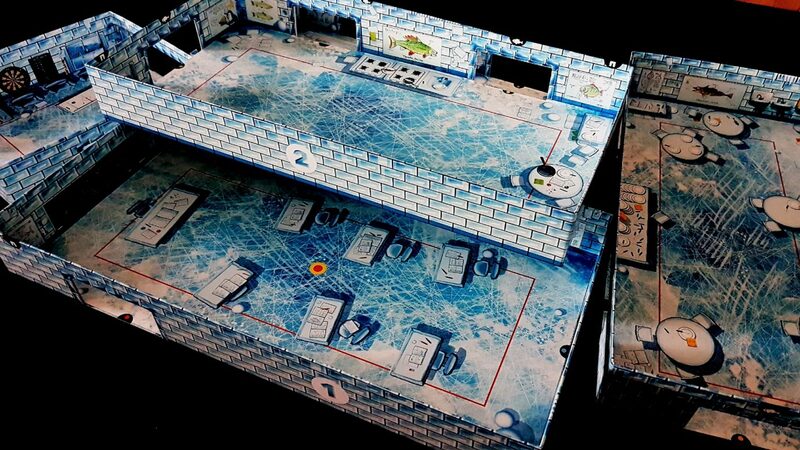 Ice Cool isn’t just intuitive – it’s a game you already know how to play. All you need to do is look at it and you’ll know how the mechanisms, such as they are, interlock. More than this, Ice Cool is a game that is a genuine physical treat in every single possible axis of experience. The setup is fun because the box is the board. The board is the box. Cats are dogs. Fingers are toes. Up is down. Wet is dry. It’s a madcap world in which we live when we see such things come to pass. Nested into the bottom of the box are other, smaller boxes. These lock together through the use of albino fish pins that are placed at strategic pinch point around the game board. The result is that while Ice Cool comes in a box no bigger than Scrabble you end up playing with a massive monolith erected on your table like some offering to a whimsically dark God. Nice, right? It takes thirty seconds to snap these boxes in place, and there’s no room for confusion when you do it because coloured dots are used to show you the arrangement. You’ll be done before you even realise what’s happened. 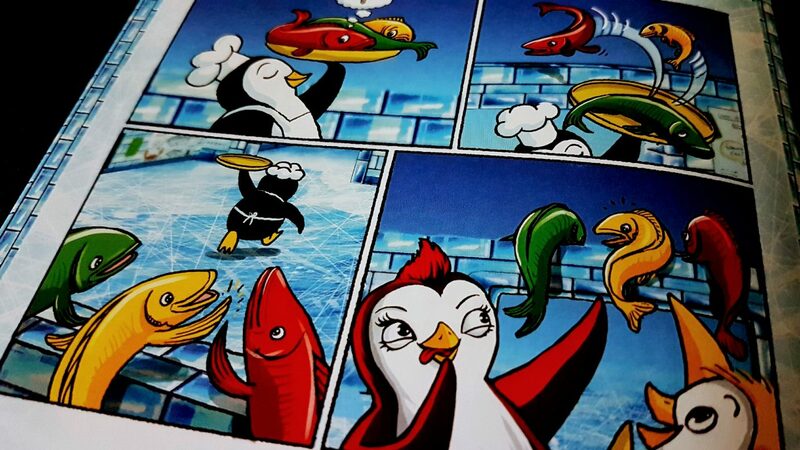 As quick as a flash you’ll be staring at the edifice that will be your arena for pitched penguin battle. This is your Thunderdome. Depending on the number of players you’ll then attach some fish tokens to three of the doors. Already you can see where this is going – you’re going to pick one of these up when you manage to knock your little penguin through the relevant opening. When you do that, you grab a card and that’s the number of points you get for your effort. 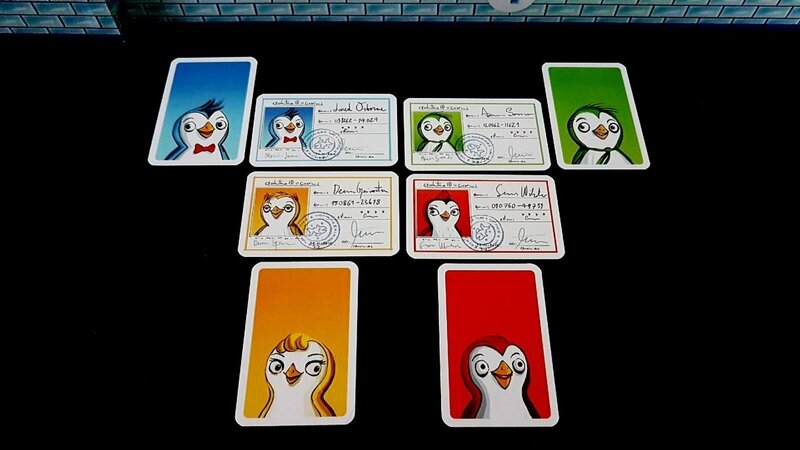 The only small twist here is in how the round structure works – in any game, one player is the catcher and their job is to knock into other penguins – in doing this you claim their ID card, and this in turn will earn you points for the effort. Everyone else is a runner, and their job is to gather up fish. Once all the runners have been eliminated, or once one player has gathered up all their fish, the game resets with a different player taking on the role of catcher. The game ends when everyone involved has had a go at both roles. Boom, that’s it – you and I could sit down (or stand up) and play a game of Ice Cool right now. And we should! I mean, not right now but you know – when are you next in town? Oh, sorry – I’m actually busy then. Look, I’ll call you with the details. Haha, yes – quite. No, I’m not going to say it. Look, because… oh fine. I will slide the deets into your mentions, fam. Making me say stuff like that is why I’m always busy whenever you visit. Let’s not quibble though because you should play Ice Cool even if it’s not with me. It’s incredibly simple and yet gives you an awful lot of pure, unrefined fun for the time you invest. It captures the tactile thrill of pinging a thing at another thing whilst also adding hundreds of small opportunities for unintentional hilarity. Sometimes in Ice Cool you accomplish something magical. Most of the time though you can’t because you’re too busy laughing at how someone else screwed up their shot – the collective failure of the group compounds because your own giggles keep you from achieving your goals. The penguins you end up flicking around here have heavily weighted bottoms (much like myself) and as such they’re about as aerodynamic as a mid-range Volvo. Your clunky sausage fingers aren’t helping things either. It’s possible to pull off shots of remarkable skill in Ice Cool by leveraging the rules of physicality. When these miraculous things happen, unless you had put in the effort to really master the game, they’re almost always acts of comedy that had an outcome that was entirely opposite to what you tried to do. Sometimes you play Ice Cool like a bluffing game – you spend your time convincing people that you really genuinely did intend to pull off that trick-shot that would impress a pool-hall hustler. In this respect it’s like any dexterity game anywhere – it’s your own disobedient mortal form that’s your biggest antagonist in play. The great thing about Ice Cool is that it’s not the only antagonist. For anything other than the two player experience, you have a lone catcher trying to stop multiple players from accomplishing their goals. That means that while technically you have two sides, one of those sides is completely fractured in its loyalties. They want the catcher to chase each other, but they don’t want them to catch anyone. They want the catcher’s attention divided. As soon as a penguin has given up its points value it ceases to have relevance to the catcher, and so their beady, baleful eye will turn the way of everyone else. To be the focus of the catcher’s attention is to add another pressure onto every flick of your fingers – and those fingers already aren’t behaving the way they should. That could add real pressure onto play if it wasn’t for the fact that the penguins almost certainly won’t go where you want anyway. 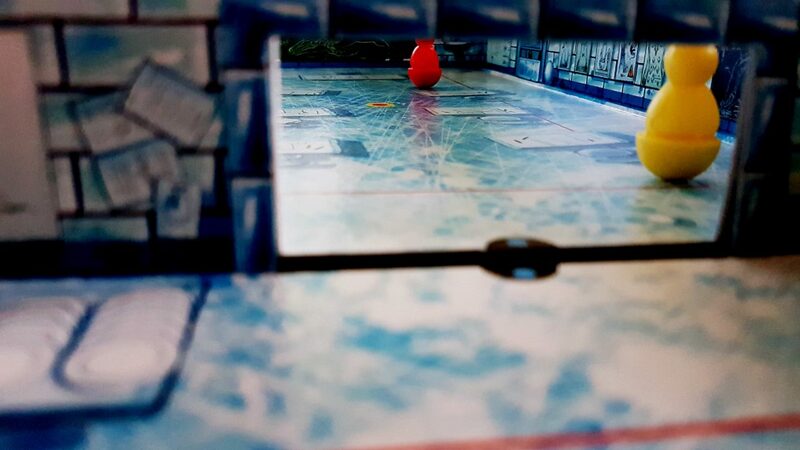 The game surface is such low friction, and the penguins weighted so heavily, that often you’ll find them just calmly curving through a door you didn’t intend, or straight into the path of the catcher. That would be disheartening if it wasn’t for the fact the catcher is probably going to miss and end up accidentally knocking another player through a door that lets them claim their fish. You are your own worst enemy. It doesn’t really matter that you’re also everyone else’s worst enemy. Robin Williams in the clip above is talking about accessibility, even if he never once uses the word. The game of golf is ‘hit a ball into a hole’, but that’s a terrible game. Nobody wants to play that game. They want to play the ‘hit a ball into a hole’ game where successive layers of inaccessibility are added and enhanced because overcoming those layers is where you’ll find the enjoyment. 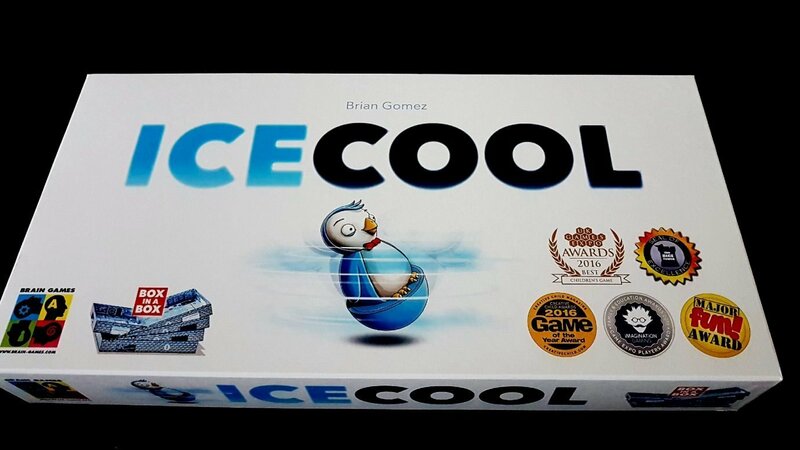 Ice Cool is a game where inaccessibility becomes a factor in the review because it’s fundamental to the enjoyment anyone will have. The inaccessibility here results is ongoing failure states imposed by unfamiliarity. Once you get past the intended inaccessibility you pass into an area of reasonable effectiveness. In those circumstances you’ll find there’s not much in Ice Cool to entertain. The game setup is just too simple, and the game environment too knowable. There aren’t places to hide, or places to lay traps. The only obstacle to movement are the doors, and the doors all line up predictably and always in the same way. Two players of equal skill will have a great time if neither of them can reliably get a penguin through a door. Two players of equal skill will have a terrible time if both of them are able to reliably curve a penguin from one side of the board to the other. Ice Cool is fun because failure is fun. Remove the failure, and you remove a very significant portion of that fun. The video above shows an extreme scenario of real skill. Even the effect of more modest levels of increasing ability has a corrosive impact on the game at multiple levels. Imagine one player is better than everyone else – not superb, not reliably excellent, just better. The fun everyone else has degrades in line with the skill differential. You’ll be in the line of fire more often than you’re not during Ice Cool, and your only defense is the inability of the catcher to actually hit their penguin where they want it to go. Playing with uneven skill levels here is to unbalance everything with no obvious way to fix it. It’s not that you’ll get a runaway winner – it’s that competence acts as a kind of sandpaper to everyone’s fun. It’ll wear it away until there’s nothing left at all. To a certain extent the cards that act as points mitigate the problem – you draw a card when you score and it might be one, two, or three points. Two one point cards can be used to act as a pair of ice-skates that give you an extra flick. That’s good, but it’s possible here that you might draw nothing but 1s while your opponent draws an unending stream of 3s. It’s possible to play much better and still lose because you got unlucky with the draw. It’s the worst of all possible worlds really. 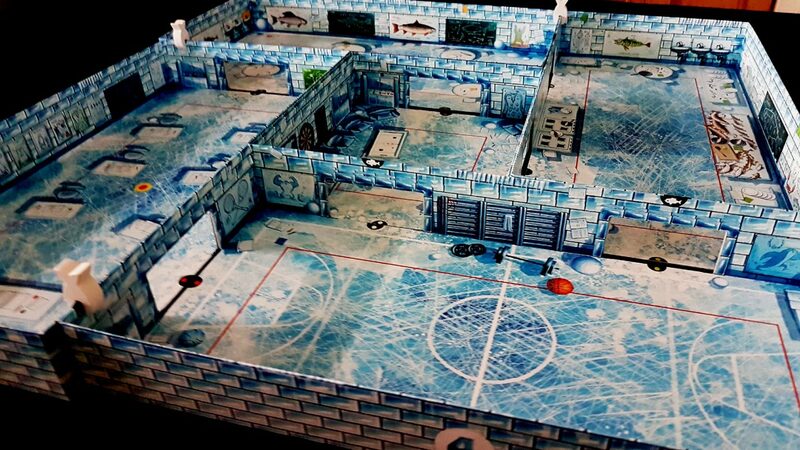 Ice Cool is a game that trends towards being less fun the more skilful any individual player becomes. It’s a game where skilful players will dominate the game and yet may still lose. It’s a game that becomes less effective as a facilitator for play the more you master its systems. And it’s a game where winning is the least satisfying thing that you ever do because the fun is in the failure. The dark heart of Ice Cool. The fish were alive all along! In any game, the experience of playing should be the best part of it – the scoring at the end is only there to make the play itself have weight. In that respect Ice Cool is working perfectly as intended – all the fun is bound up in the activity itself. The problem is you can’t balance for skill levels by essentially randomising the score. Or rather, you can but all it does is wallpaper over structural cracks in the game’s foundation. It might seem balanced to know that everyone gets a chance to win – that’s an illusion though. It’s a trick with statistics. The look of the thing will not be the feel of the thing. All of this sounds very negative I know, so we should end this review on a positive uptick. Ice Cool is a lot of fun. A lot of fun. Ice Cool is a game that looks marvellous on the table – like Potion Explosion it’s as much a conversation piece as it is a plaything. And while you’re bad at it you’ll find lots and lots and lots of reasons to play it with a wide range of mixed audience. Its immediate intuitive design means that you’ll can arrange it so that you’re almost always playing with people that are going to enjoy the experience. You will generally not find people resistant to giving it a go because everything about it draws you in. It’s just that the more that you play it the better you’ll become, and the less fun you’ll make it for everyone else. Perhaps Ice Cool should be thought of like a fine book with lessons to teach – to be owned and absorbed and appreciated. Then, when you have drained it of all its wisdom, it should be passed on to another worthy soul to appreciate the whole thing anew.